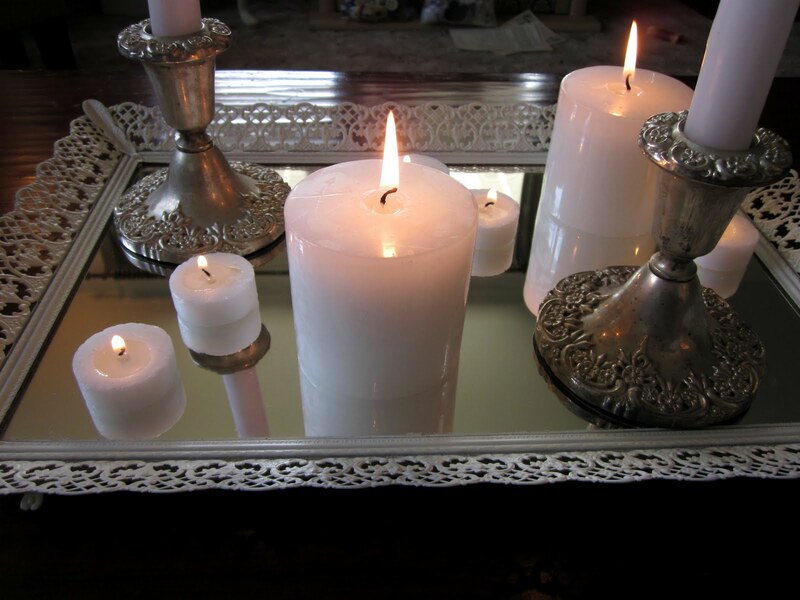 Transform a thrift store mirror into a show-stopping mirrored centerpiece in just a few easy steps! 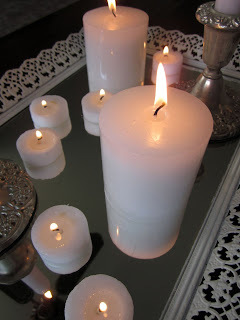 This is a budget friendly home decor idea for any home! the beautiful detailing practically screamed, “Take me home now!” while it was surrounded by a pile of junk. Of course I listened! First step: CLEAN the mirror. I was surprised how it was truly in perfect condition! Fourth: Remove the tape, and decorate! I got the silver candlesticks for 90 cents each at the thrift store about a year ago, and I hadn’t found the right place for them. I think these are a perfect match for the tray! 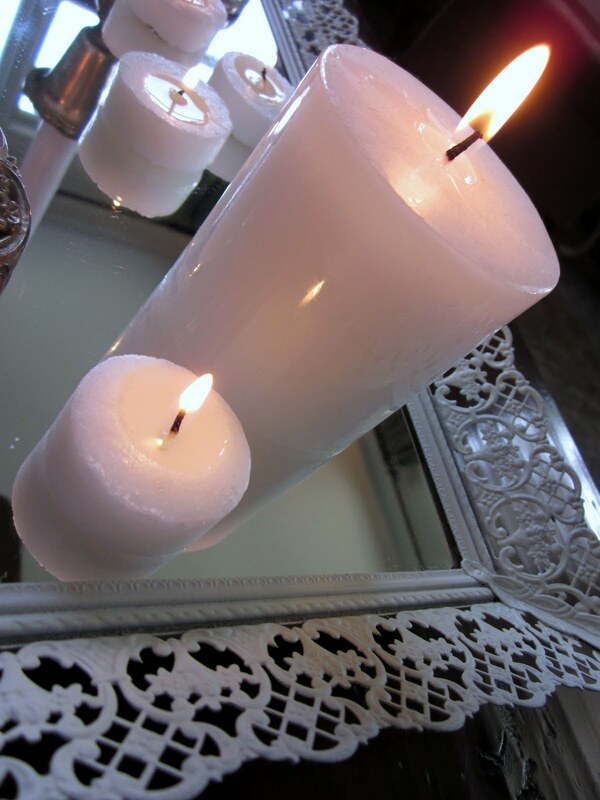 I will be keeping the white candles on for now…but I know this will be something I’ll look forward to changing as the seasons change! OMG.. you never cease to amaze me- this is beautiful. I thrift shop from time to time and never seem to have this kind of luck- maybe luck will strike this summer when I have more time. 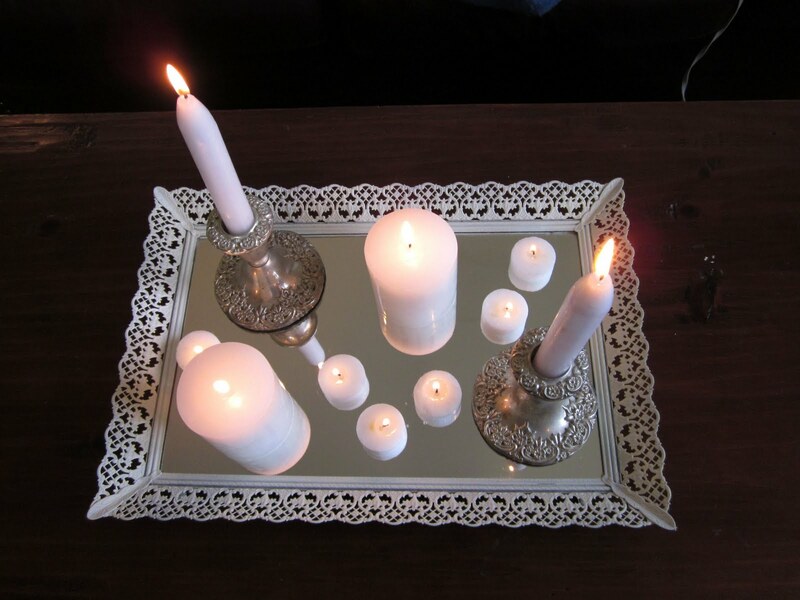 Looks very elegant and easy! I have never been to a ReStore. I must get there. Great find! You are awesome! This is beautiful! I love the re-store! Very nice! This just made me think of the mirrored vanity tray I have that's gold colored. I could do the same thing with it!!! I would like it so much better if it wasn't gold!!! This looks beautiful!! You did such a nice job and the candles look great! Buckley is so cute! This is beautiful! Definitely calming, and white candles are so timeless. Nice find! Love it! I need one of these for my dresser in my bedroom! gorgeous!! Great find. I love the restore!! What a great find 🙂 I never have this kind of luck! love that! glad you didn't pass it up! I love it! I'm all about mirrors and candles they dance with light. 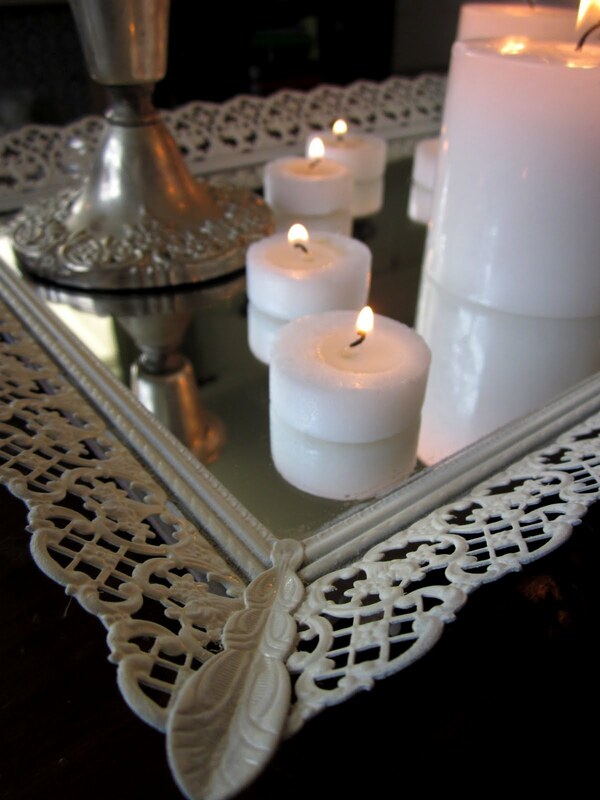 this tray is really great because it is a mirror and has a touch of femininity too. What a very creative way to use a mirror. Love it! 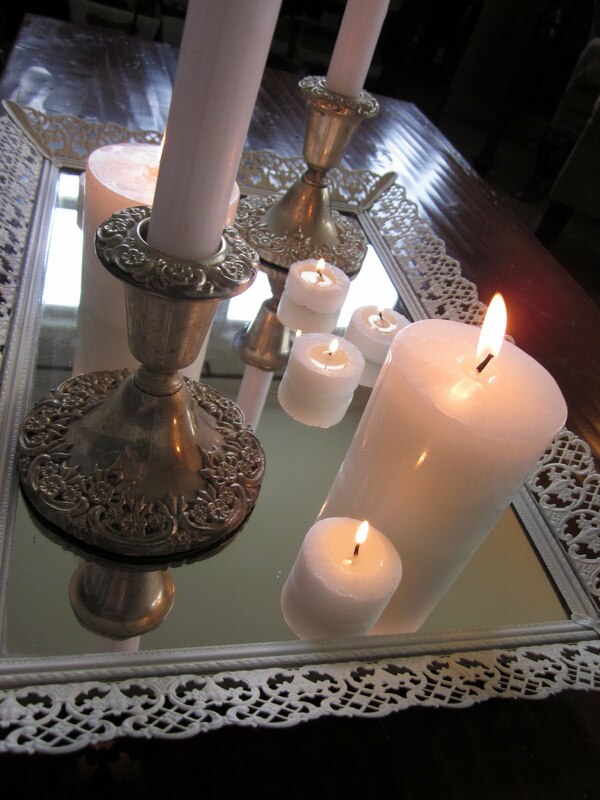 and it matches the candlesticks well. I had a mirror almost like this when I was little. I should of kept it! I love that you repainted the metal. 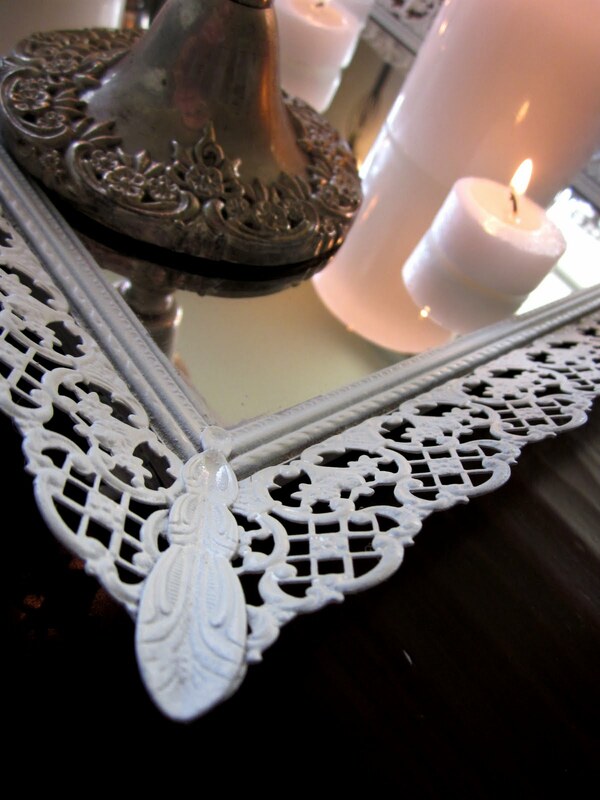 The mirror completes the look of your fun display! Thanks so much for linking up to Terrific Under Ten today!! You rescued a great piece! It's amazing what a little soap and water can do, huh? If I buy anything dishwasher safe, I always run it through a cycle and am AMAZED at the wonderful change. Your paint is great for the mirror! Love it. Love the way your centerpiece turned out! Really pretty. I found a mirror just like that one at the Goodwill last summer… funny I just kind of stumbled upon your blog today…. I did the same thing with spray paint… right now I have it displayed on a shelf with an empty bright blue frame and some other pretties!! My mirror was brass before though, people were looking at me like I was crazy when they saw how excited I got when I found it!! Pretty! What a great revamp! I'm featuring this project tomorrow at My Backyard Eden. Thanks for linking up! How cute! I found one of these at GW and painted mine with Krylon Brushed Metallic and it turned out lovely! Thank you for sharing your beautiful center piece! I’m not following you. Please stop by bellanest.blogspot.com any time! I AM following you, so sorry!!! want a simple classy idea and look. I found your link at the Spring link party at Thrifty Decor Chick. 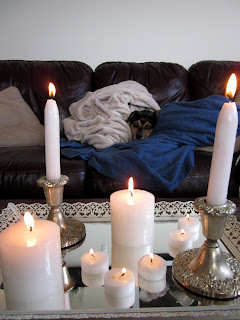 I hope you come over to my blog and visit. 🙂 B-T-W, what kind of a dog is Buckley? He’s adorable!